Whoa...it can't possibly be time for the June Currently! It seems like just yesterday that I missed the May Currently! Well even though I am beyond busy and overwhelmed I couldn't let 2 months go by with out participating in Farley's linky! So without further delay here is my Currently! Listening: My hubby has decided that it is time to introduce our kiddos to Star Wars so we are starting with the 4th or 1st movie depending on how you number them! My 10 year old loves it....my 6 year old is not so sure! 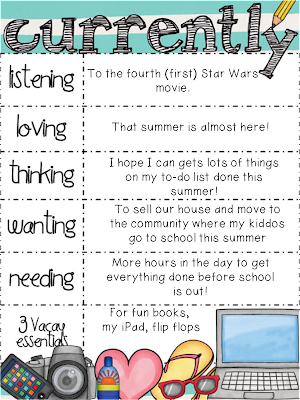 Thinking: My summer to-do list is LONG but I can't wait to get started...hoping I will be motivated to get it done. Wanting: To get our house on the market SOON so we can hopefully sell it and move over the summer. Our kiddos go to school about 25 minutes from where we live now so it will be great to FINALLY live in the same community they go to school in! 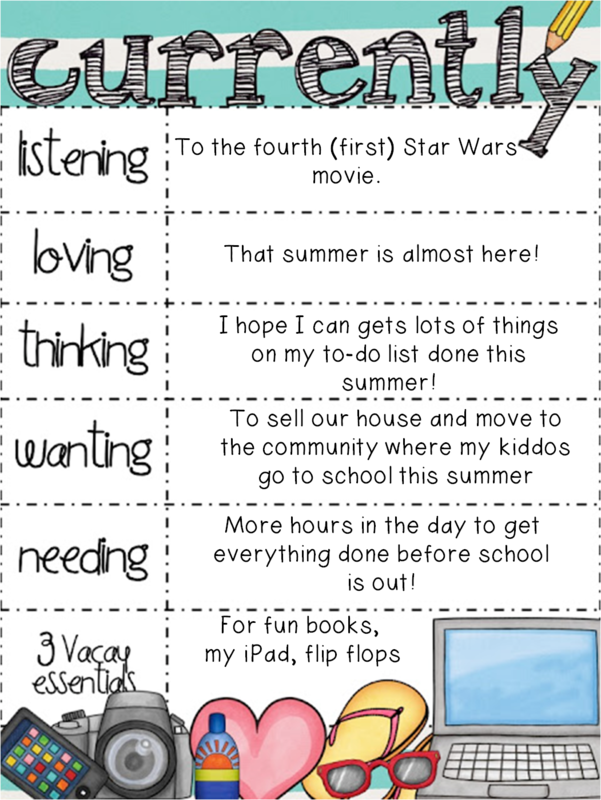 Needing: More hours in the day.....I still have report cards, volunteer gifts, a slide show and more to get done!! AHHHH! 3 Vacay Essentials: Books to read just for fun...because who has time to do that during the school year?? ?, My iPad so I can blog stalk of course and my flip flops because I live in Wisconsin and our time in flip flops is short so you have to make the most of it! Hoping to be back soon to tell you the story of my field trip debacle from last week and to share a cute beachy themed art project (from the same field trip). I missed the May Currently too, and we're house hunting as well! We have a few things in common. Your blog is super cute- love the flamingo header. I love your layout! It's so adorable! Good luck with your move. I am hoping to move to a new community as well but I think it will be delayed for a bit.